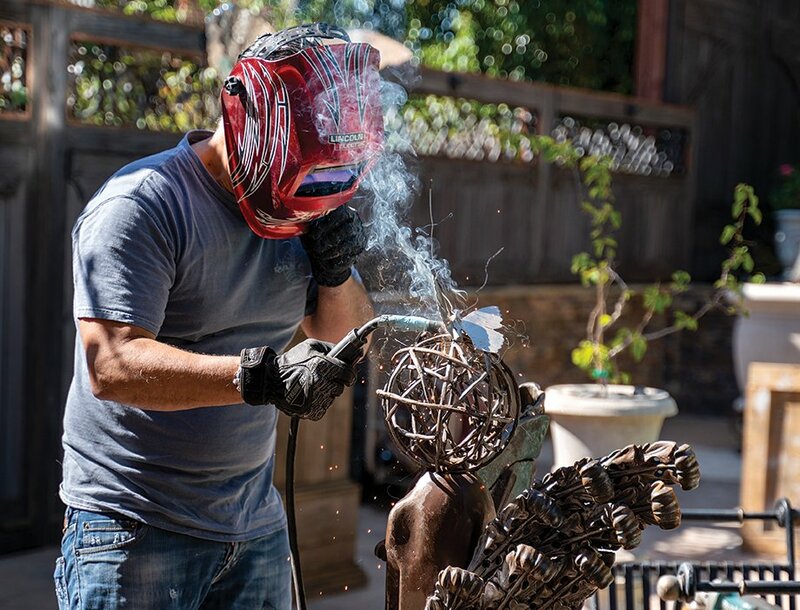 For our Secret Lives of Seven San Diegans feature, get to know Cesar Mendez, a door and entryway maker who discovered fresh inspiration in sculpture and art using found objects. 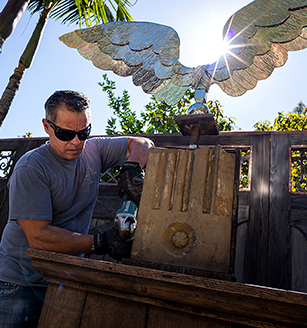 Grand Entrances’ Cesar Mendez works on a one-of-a-kind found-object accent sculpture. Cesar Mendez walks around his courtyard pulling curly iron vines from behind trees, planters and bushes. They are pieces he’s purchased or found and wants to use somewhere but doesn’t quite know where yet. “Maybe I’ll weld some of them to this sculpture,” he says. The piece he refers to is the “Tree of Life” sculpture he created as a tribute to his roots. The boy statue in front is meant to be his father (though there’s no likeness); the beaded iron that wraps the stone column under the tree is symbolic of the hardships his father endured. And the sprawling branches represent the growth and achievements Cesar and his siblings have accomplished from the foundation their father created. Cesar’s success grew from humble beginnings. Nineteen years ago, Cesar and his now business partner, Colin Pearce, won one of those grocery store games people play, collecting pieces over a period of time and trying to match them to some sort of game board. You know, the kind you assume no one ever wins? The pair’s prize was a boat, but the practicality of owning such a thing—maintenance, mooring fees, plus, they just weren’t really boat people—wasn’t for them so they sold it. And on a whim (Cesar had been working at a bank), they opened Grand Entrances on Miramar Road (not in their current location) to sell doors to builders. Or so they thought. For seven months, Grand Entrances didn’t see a single customer. Then Cesar started designing custom doors—again, somewhat impulsively—and business started booming. Clients weren’t builders but individuals seeking to have a one-of-a-kind door made. It was also this time that Cesar began doing design work on his house, renovating the front enclosed patio at the Scripps Ranch home he shares with husband Howard Hardin. And it was while he was acquiring items for it—to create a French Provençal-inspired courtyard—that he discovered another passion and talent. 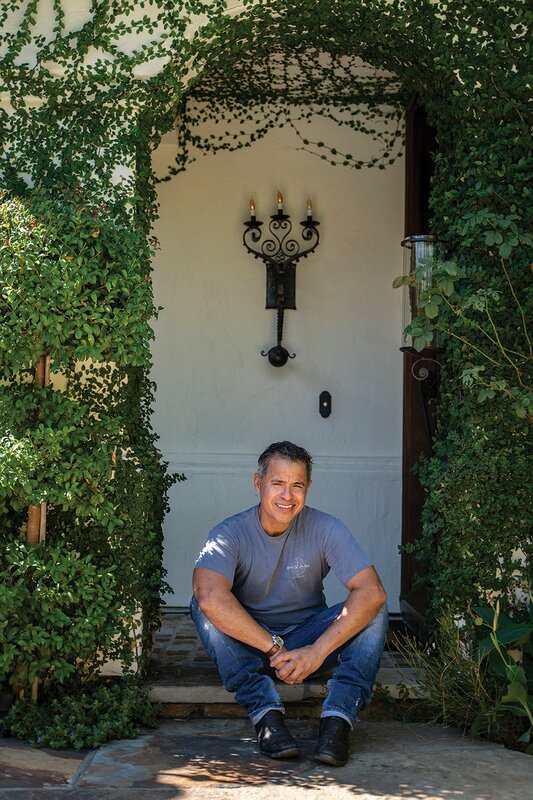 It was here, Authentic Provence, Inc., that he purchased his first “found” object, an antique limestone fountain for the personal oasis he was creating in San Diego. Owner Susan Hofherr also gave Cesar an education in the proper way to hunt for relics. She helped him understand authenticity, regions of origin and what to look for in pieces he found. “From there, I was always looking for the next treasure—whether I had a use for it or not,” he says. He took his newfound hobby online and started looking for items for his home and yard on eBay and other resell sites. From there, Cesar worked architectural finds in where he could: He used stones he found in Berlin in a gate he designed; a 17th-century Italian statue in a landscape he helped sculpt; tiles he bought in Morocco onto a home’s façade; and iron leaves into angel sculptures he welds. 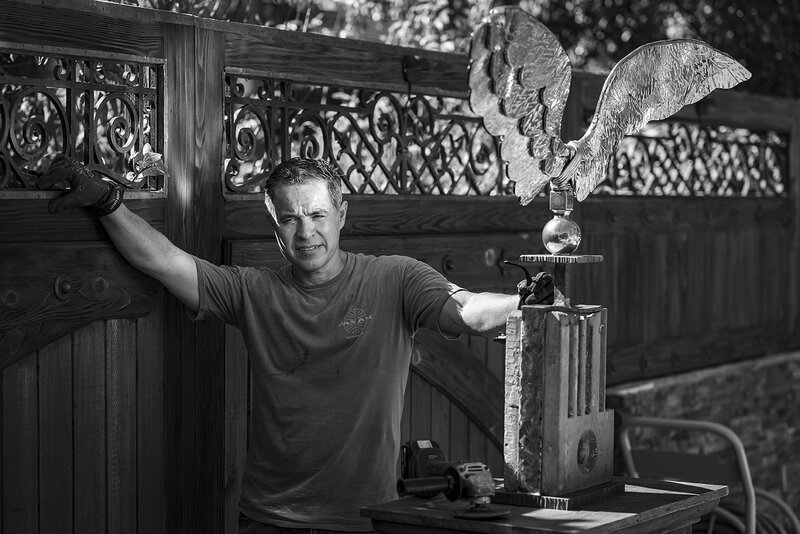 Now, he’s got a warehouse full of fountains, religious artifacts, chandeliers, hand-carved mantels, pottery and wrought-iron accents he’s purchased, and a new business he began this past fall. Grand Entrances Home Cesar Mendez Designs sells these antiques and one-of-a-kind decor and relics that he curated during his travels to San Francisco, Chicago, Miami, Europe and more. And it’s also the vehicle in which Cesar highlights this other side of his creative talents. 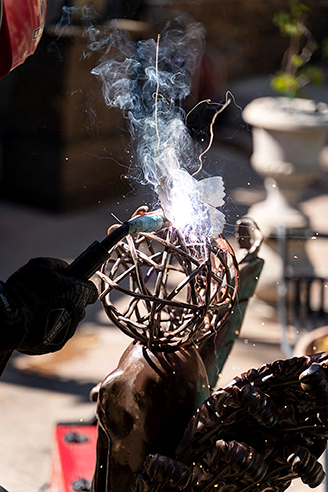 Customers can purchase pieces from his collection, sculptures Cesar welded from discovered architectural items, or enlist him to incorporate the elements into a design.